Here’s your latest essay interview with 7th place winner Daniel McCarthy from the 13th Adonis Golden Ratio Transformation Contest. There I was the day after Christmas, 2011, at Gold’s gym doing my third set of front squats at a fast pace. It was part of a HITT protocol that used weight training and body-weight movements to get your heart rate up and keep it up. My cardiologist was all in favor since I had done a Bruce-protocol treadmill stress test for him the previous month and lasted fourteen minutes. The received wisdom is that if you can last longer than ten minutes, you are basically immune from heart attacks for the next five years. So it must have been my inner snowflake that got busy that day. When I came to and started talking to the nice young paramedic, he told me that I had blacked out and they had had to use paddles to get my heart restarted. The next week, after I got my very own implanted defibrillator, I started thinking about what I could do to avoid any repetition of training to near-death. I decided I would stop doing any routine that demanded HITT-type heart rates, and I thought that getting my BMI down from about 26 would help stave off future problems. When I was looking for a weight-loss program coupled with exercise, I ran across Eat Stop Eat and eventually the whole Adonis Golden Ratio program. I was attracted by the podcasts and the careful, explicit, science-based approach to weight loss and exercise that AGR uses. 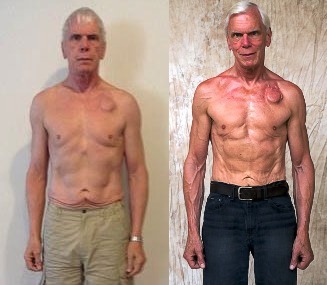 I was also impressed by the before and after photos that came with the podcasts. I bought AGR 3.0 in June, 2012. 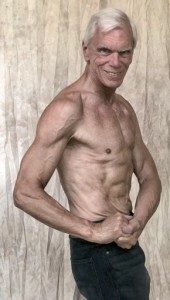 I figured that since I was 68 years old at the time, a transformation would probably take more than twelve weeks; but to give myself a running start, I joined the transformation contest (AT 9) that started in August. I started the contest with a 34” waist and 46” shoulders at a height of 6’0” and an AI of 1.31. I ended it with golden waist, (32.1” but far from golden shoulders (~46” instead of the 52” I needed). My AI was at 1.43. I kept on working out and keeping track of things through AT 10 and 11. About one month into AT 11, I had my first-ever DEXA scan, and found out I carried 13.9% body fat. 14% fat!! 24 pounds of fat on my (I thought) skinny 174-pound frame!! I had my second DEXA scan about six months later at the end of AT 12, confident in the fact that my AI was up somewhat (about 1.46), and I thought I looked better. Maybe I did, but my body fat was almost 1% higher, at 14.7%. I know that these are just numbers, but they clearly are not contest-winning numbers. I consulted my inner snowflake and decided that if I couldn’t get an additional 5 inches of shoulder breadth, I would make my 47” shoulders golden with respect to a far slimmer waist – about 29” per my calculations. Although this was not my true golden waist with respect to my height, I thought I would see how I liked the look and made it my goal for AT 13. 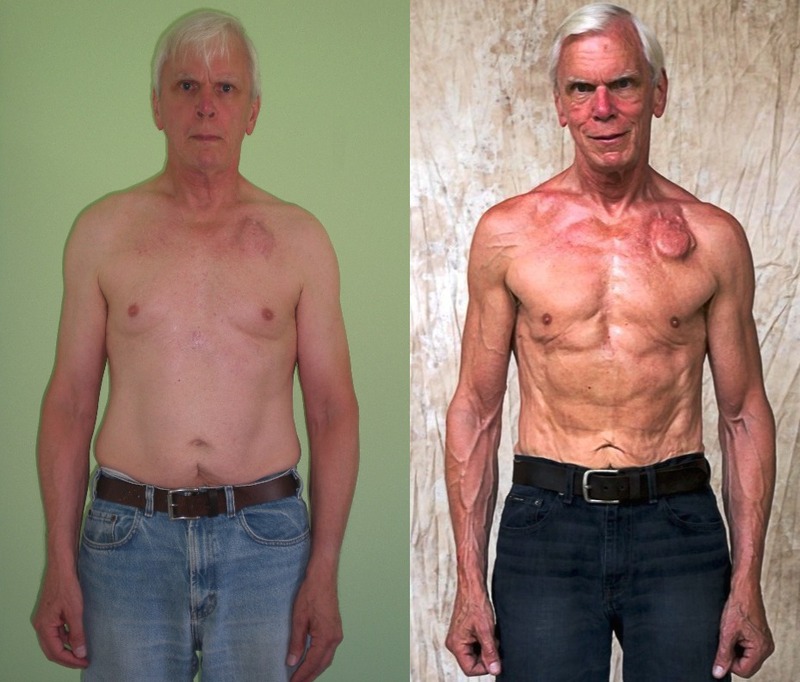 I had also read that a reputable journal reported that muscle growth in men ~70 years old was significantly greater when they followed a regimen of six sets of a given exercise instead of the three sets that are usually sufficient for younger men. I do not think there is anything magic about six sets vice five, or seven, or eight; it is, however, the number of sets used in the study, so I evolved the following plan. I would use AGR 3.0 and add a basic shoulder or chest booster every workout. One extra set would be added to the exercises in AGR 3.0 that specified five sets. If the shoulder or chest booster appeared to work one body part for six or more sets (e.g. dumbbell flyes for three sets and cable crossovers for four sets), the booster would be performed as written. If no exercise in the boosters met this criterion, one of the supersets would be increased to six sets of the two exercises, with the other exercise being performed as indicated. Basically this amounted to adding a maximum of one set to one exercise in the main workout and three sets to two exercises in the boosters per day. I found over the weeks that this was sustainable, and that I could do it without injury or excessive fatigue. My DEXA scan on 4/13/2014 proved that my plan is working. My total body mass is down by 2.5 kilos since my last scan at the end of AT12. My total body fat is down to 12.5% from 14.7%. I have lost 2.4 kilos of fat and gained 1.6 kilos of muscle mass in my trunk alone, while adding ½” to my shoulders. (One downside: My legs have less muscle mass and a little more fat mass than before because I lowered the resistance on all of my lower body exercises to avoid joint pain.) My AI ratio has increased from 1.46 to 1.58 currently. I missed my 29” waist goal by about ½”, but that’s OK. The changes I see clearly are not happening at the same rate that younger men experience them, and more work remains to be done; but I have learned some patience over the years. I’ve also learned the difference good photographs make. I have been working with a professional photographer friend of mine for the past three contests. 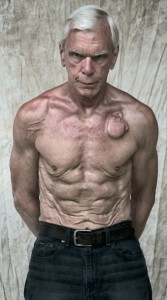 He had never done physique photos before, but he paid attention and improved his technique with each contest. It helped, too, that as I leaned out, he could better see what I was looking for in the results. (PM me if you live in the Los Angeles area and would like to contact him.) I would also like to mention that the cost of becoming an immersion client was some of the best money I have ever spent. In the coming weeks I plan to gradually increase my calories from slightly below maintenance to the point where my waist stays approximately golden while my shoulders and chest fill out. I will use the Muscle Building Foundation and increase the five-set elements to six sets. I’ll have another DEXA scan in about three months to see if I’m on track. In the meantime, I have been getting some positive feedback from family and friends, and I like how I look at a 1.5+ AGR. Some of the guys at the gym (same gym for 5 years, same guys) have also commented on my new look and seem to be friendlier than before. My doctor says my blood work is remarkable for a man of my age; and I aced a recent treadmill test – not that that’s a huge comfort given my past experience. It’s been two and a half years since my episode, I’m fifteen pounds lighter, my BMI is at 23.6, and my defibrillator (which reports every night to my electrocardiologist – don’t ask, she’s a nice lady) has not had to kick in even once. I’m looking forward to having more time above ground to get to a true golden AI. In the meantime, I put every workout I finish in the win column; after all, I could have been done with any and all workouts on December 26, 2011. Patience is definitely a virtue and you have clearly demonstrated the AGR principles are timeless and you can strive for “Golden” even in your Golden years. We look forward to hearing more updates from you in the future!